Yao Ming goes up for a dunk over the New York Knicks’ David Lee on Saturday night. 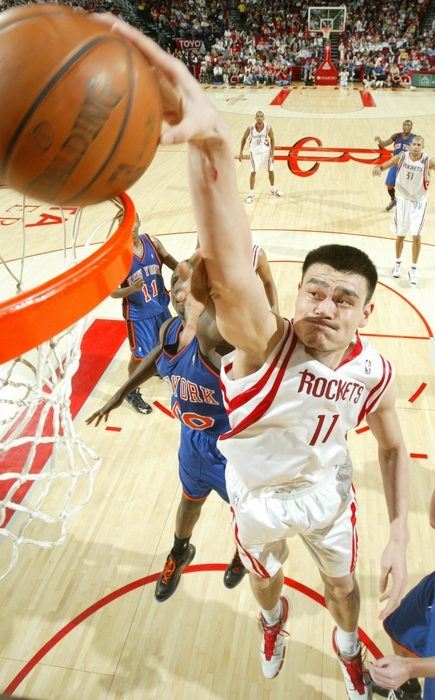 Yao was dominant, finishing with 30 points, 8 rebounds, 6 assists and 4 blocks in a 103-91 win. Aaron Brooks was also incredible, scoring 22 points on 8-of-10 shooting and amazing everyone with his speed and three-point shooting. Click here for more photos from the game. Saturday night’s game between Houston and New York represents the reason why I love NBA basketball. Not just because the Rockets beat a team they were expected to beat — a Knick team that has been trashed in the media because of their 8-23 record, underachieving roster, and embattled head coach. I loved this game for a variety of reasons other than the 103-91 final score might indicate. I loved this game because a player who many people questioned being worthy of a first round draft pick showed everyone — except for the die-hards that believed in him early on — that he not only deserved to be a first round pick, but that he should be playing significant minutes in this league. Not only that, but he could also be the surprise of the NBA draft, and perhaps (hopefully) become a member of the league’s elite point guard fraternity (Tony Parker, Steve Nash, Chris Paul, Baron Davis, just to name a few) that the Rockets have been seeking for years. Wow. Of course, we’re talking about Aaron Brooks, drafted 26th in last year’s draft. Brooks has been showing everyone lately, including Rick Adelman, that he is a force who is extremely difficult for anyone to defend. Many of us knew that for weeks as it took Adelman way too long to figure out. But better late than never. Adelman gave Brooks the most number of minutes (24) he has played all season Saturday night, and AB delivered again. Hopefully it wasn’t just because there happened to be a just-as-small point guard on the Knicks in Nate Robinson who probably made Adelman feel that it was “safe” to put AB in there from a matchup perspective. Brooks showed he’s not just a guy you stick in there when the opposing point guard is short and/or quick. He got into the lane on multiple occasions and scored on beautiful shots around the rack. You might say that was because the Knick defense is porous, and that’s part of the reason they are 8-23. But then look at AB from the outside, and he showed he was the real deal out there as well, hitting 4-of-5 from behind the arc on his way to 22 points on 8-of-10 shooting (and his lone 3-point miss was a long half-court shot at the buzzer as a might-as-well-give-it-a-try shot). So many times AB got to the rim with blazing speed to finish, it just made your jaw drop. You may see that a couple of times out of Tracy McGrady in a game when he’s healthy, but when you see it time after time from AB, he quickly becomes someone you can’t wait to see what he’ll do next. I get the same feeling when I’m watching Vince Young scrambling out of the pocket: you just hold your breath to see what he’s going to do next that’s amazing. It kind of reminded me a little bit Friday night when I watched Chris Paul of the Hornets get to the rim over and over in the fourth quarter to destroy the Golden State Warriors. He was unstoppable, as was Brooks Saturday night. There was that one play with 1:07 remaining in the first half when there was a loose ball, AB grabbed it, then immediately jetted up-court toward the basket and was fouled. I don’t think I’ve ever seen a Rocket player pick up a loose ball so far away from the basket and blow past 2 defenders and aggressively take it to the rack like that. After getting fouled, AB stepped to the line and made both free throws for a 77-67 lead. Then at the 10 minute mark in the 4th quarter as the shot clock was winding down, Yao had the ball under the basket and was trapped by two Knick defenders, so he threw a perfect pass to Brooks out behind the three-point line, and Brooks drilled a big three as the buzzer sounded! That was a huge bucket that made it 82-72, Rockets, giving them some more breathing room. At the 8:38 minute mark, Brooks grabbed another loose ball in a wild scramble around mid-court, then immediately took off toward the basket strong and hit a runner in the lane! Then at the 5:53 minute mark, AB took it into the lane and scored an unbelievable shot off the glass to make it 93-81. He did the same thing with 4:40 left when he scored on another layup in the paint! AB wasn’t all about offense, though. At the 3:37 mark in the fourth, he stripped Stephon Marbury as Marbury took it strong to the hole, and AB tied him up for a jump ball. That got the bench off their feet after that play! Finally, AB capped off his career-high game with a three-pointer with 34.6 seconds remaining to give the Rockets a 103-91 lead to seal the victory. To his credit, Adelman has been increasing AB’s minutes lately, but Brooks has been making that decision a no-brainer. To do otherwise and not give him significant minutes would be a travesty. I was already perturbed that it took this long, but now that he’s getting the minutes, how can he reduce his minutes now? If Adelman is smart, there’s no way he can do that. This situation reminds me a lot when Sam Cassell was a rookie and started blowing everyone away with his poise, penetration skills, and ability to hit the big shot. Sam became a fan favorite (and still is, in Houston). It’s scary that Brooks may be better than Cassell. Speed has a way of doing that. Just like with Sam, I can’t wait to see AB’s next game, and the next, and the next. Brooks, the guy who most everyone can relate to because of his height (he’s only about an inch or two taller than the average man in the U.S., like me), is not only exciting to watch, but his demeanor is so calm and introspective. You can tell he’s a thinking man, kind of like Yao or Shane Battier, but with a jetpack in his shoes. Okay, I’ll calm down from my AB fix and get to other reasons why I loved this game. Of course, Yao Ming was another one. He was “The Man” in the 3rd quarter when he couldn’t be stopped on his way to 13 points in the quarter on 6-of-7 shooting, and would finish with a game-high 30 points on 12-of-21 shooting. He was aggressive on the offensive and defensive boards, getting a couple of rebounds and throwing them down for emphatic dunks, as well as hitting those sweet turnaround jumpers. He also ran the court hard on a fast break and was rewarded by Rafer Alston with a long pass up the court for a dunk. Last but not least, he blocked 4 shots! Makes you start thinking if he keeps this up, he could win Western Conference Player of the Week again soon. It was a little strange to see Yao getting the ball so much in the third quarter and dominating like he was, considering the way the Rockets did so well in the first half was by having a diversified attack with other guys having success in their own right. Yao was 4-for-11 in the first half with 13 points, but meanwhile, Luis Scola had 10 points of 5-of-6 shooting, Bonzi Wells had 9, and Brooks had 8. In the third quarter, that all seemed to change. It was like the Rockets were determined to get the ball to Yao and have him dominate by taking 7 of the Rockets 18 shots in the quarter. I guess I’m okay with that, but as we have seen with McGrady, if you go too much to one guy, it can take everyone else out of their rhythm once that player eventually goes cold. Luckily Yao didn’t cool off. He hit 6-of-7 shots for those 13 points. And when the Knicks did get close on one of several runs, Luther hit some big shots to hold them off, finishing 2-of-3 from the field for the quarter. Any worries about stagnation if Yao were to cool off were put to rest once Brooks entered the game in the fourth quarter, who just seemed to get the ball moving again and put the pedal to the metal applying more pressure on the Knicks’ defense. Once he started penetrating, it opened things up for Alston, who hit 3-of-5 shots in the fourth. AB would finish by hitting all 5 of his shots, including 2-of-2 from three-point territory, for 12 points in the quarter! Because of AB’s effectiveness, the Rockets didn’t even need to bring in Scola for more firepower. What a luxury when you can keep a guy who was 5-of-6 from the field in the first half on the bench. The depth on Houston’s bench may not be so bad after all with the emergence of AB and Scola. The other reason why I loved this game was because Yao showed just how much of a force he can be with his passing, finishing with a game-high 6 assists. Several of those dimes came from dishing passes to cutters into the lane like Luther Head, Shane Battier and Alston for layups in the first half. I know, I know, you might be saying the Knicks defense is like swiss cheese and it’s easy for anyone to do that against them. But we must give credit where credit is due. At least most of the Rocket cutters were getting into the lane and not standing around, something we hopefully won’t see again when McGrady gets back from his injury. We’ll have to cross that bridge if and when we get to it. The other thing I loved about this game was that the Knicks didn’t fold, and really tested the Rockets to force them to think and strategize on how best to fend teams off when they are making a charge, something they didn’t do too well Friday night in Orlando. Time and time again in the second half on Saturday, the Knicks would make a run, and the Rockets responded. That’s what this team needs to continue doing – going through the pressure cooker they are sure to experience when they play tougher opponents (and maybe the playoffs? ), getting more experience and confidence that they ARE good enough to surprise a team or two if they are fortunate to make the playoffs. With the victory and all the great things I’ve been writing about here, there were some negatives. I was very frustrated at the beginning of the game to see Luther and Alston not playing a smart game and settle for 3-pointers (which were all bricks). It’s like they thought they could start playing “real” basketball whenever they wanted and win because it was the Knicks they were playing, so why not jack up a few? It was very McGrady-like as Luther missed all 3 of his trey attempts (1-of-5 three-pointers for the game), and Alston both of his in the quarter (2-of-8 overall). If it wasn’t for them making up for it by attacking the basket as well, I would want them sitting on the bench more often than not. I can’t leave out Battier, who was 0-for-4 from three-point land for the game, and 2-of-7 overall for 4 points. But since shooting threes is about the only thing he ever tries to shoot (even though I think he’s got better offensive skills than that), it’s not like Alston and Head where you know they have other ways to score, like off the dribble. Fortunately the Rockets were able to get away with their 3-point shooting mistakes, and led 27-13 at the end of the first quarter. In the second quarter, the Rockets shot 10-of-19 from the field, thanks to my other favorite addition to the team this season, Scola, hitting 5-of-6 shots in the quarter. Meanwhile, the Knicks got their act together by hitting 12-of-21 in the second, thanks to another small point guard doing some damage. Even though I’m not a big fan of Nate Robinson‘s because of some of the thug-like activities he has done on the court (remember the so-called “block” he had on Yao a couple of years ago when his hand came through the ball and slapped Yao in the face, with no foul being called? ), he did respond by hitting 2-of-2 three-pointers in the quarter, and almost single-handedly kept the Knicks in the game, scoring 25 points and hitting 5-of-7 treys. That’s another reason why I loved this game. Since I kind of feel bad for the Knicks, for reasons like the recent death of Marbury’s father, all the bashing they are getting from the media, and for doing the Rockets some favors over the years like taking some expensive, dead weight off their hands (e.g., Maurice Taylor), it was nice to see players who have every reason to not show up play with some inspiration and really try to win. One other reason why I loved this game: Dikembe Mutombo has hardly played this season, but when Yao got into a little foul trouble in the first quarter, Deke came into the game and got two blocks that were difference makers and showed the old man still has it. I also loved this game because of some of the action I saw on the bench. Although Steve Francis was in street clothes because of his leg injury, he was up off the bench and yelling for his teammates when they did things well. Earlier on in the season he was pouting, but now he’s one of their biggest cheerleaders. I love it. I also loved the interaction I saw between Yao and Brooks during a timeout. It was a very instructional conversation going on with Yao doing most of the talking and using his arms to describe to Brooks what should be happening on the court during certain situations. The rookie took it all in, then at the end of the conversation, smiled and even laughed at, and with, Yao. He wasn’t afraid to muck it up with an All-Star in the midst of an NBA battle. He has the confidence to be himself in any situation, no matter how much taller, bigger, or experienced the other person may be. All of the guys are learning about each other, with Yao maybe learning more about Brooks at the same time as many around the league are now learning. I can’t wait for Tuesday’s game to see what AB will do then. It’s been a long time since I’ve had that feeling with the Rockets, dating back to when Yao was a rookie or when he was making a run for winning league MVP last year before getting hurt. This entry was posted on Saturday, January 5th, 2008 at 11:59 pm	and is filed under vs. New York, Yao's best games. You can follow any responses to this entry through the RSS 2.0 feed. I didn’t see the game and only listened to it online. What happened with Scola? He was rolling offensively at one point, then suddenly was yanked from the game and didn’t appear again. I noticed that he got pulled out after a good run by the Knicks. Was it Scola’s poor defense that kept him from the floor? Brooks has been getting a lot of PT lately, but from what I have seen, the majority hasn’t been at the point guard spot, its been as a combo guard in the 2 hole. Doesn’t surprise me though, bc that is what he played in college. He has been playing great and injects a lot of enthusiasm into the lineup, but it will really get interesting when Mac comes back. Alston is pretty entrenched as the PG starter, I don’t really see Adelman changing that (he played 40 minutes tonight), plus Brooks hasn’t had any significant duties as far as running the team for significant amounts of time. It seems to me that there are three options when Mac comes back. 1. Luther Head will lose significant PT to Brooks as the backup SG. This makes the most sense to me, since Brooks is just like Head, an undersized SG (both were in college), but he brings more to the table than Head. I think Adelman is slowly turning Brooks into another Bobby Jackson. Small, mismatch shooting guard coming off the bench for bursts of offense. Maybe this could be a good reason to put Head on the block…..
2. Mac moves to SF, Brooks comes in as SG, and Battier goes to the bench. I think this is the least likely because not only does it screw with Bonzi’s playing time (which is one of Adelman’s favorite mismatches) but it puts our best defender on the bench; and you know Mac can’t defend worth a damn. Plus, Mac has said he likes the SG spot because you don’t take the physical punishment of the SF spot on offense. 3. Alston and Brooks become a platoon at the point. I think as much as everyone has pined for something like this, from day one getting MJ and SF, and with Alston being the big scapegoat and all (somewhat justifiably so), I also think this is unrealistic given the coach. Obviously Alston handles the total point guard package the best on our lineup. I even think Brooks helps Alston stay on the court more. The big knock on Alston is his lack of scoring, but hell, if Brooks is coming in a la Bobby Jackson and scoring in bunches, it minimizes Alston’s lack of offense. Who knows. Whatever happens, the great thing is that the Rockets are improving. We have more than just two players avg’ing double figures now, and the offense is looking better and better; all without our leading scorer. Throw him back in, and we might be ready to go on a serious run. New systems and new coaches do take time to adjust, and I still have faith in Adelman. When coaches are too fickle and change too much too fast, you can end up with a situation like Larry Brown in NY where he had like 60 starting lineups in one year. IMHO, the players need consistency, and incremental change. But anyway, loving the last two games (even if one was against maybe the worst team in basketball…)! Thanks so much for all the work. Glad to see you pumped up again!!! Great analysis, Allen. I think option #1 will happen, but when Brooks or Alston struggles (like everyone does), then Head will start sharing more of the time with them. I wish they would add this twist and say that they’re going to bring McGrady along slowly because of his knee, like maybe 20 minutes a game so that Brooks can still get plenty of playing time. I have always had faith in Adelman’s system, but this year I’ve been more critical of the coach himself for not “staying the course” and reverting back to last year’s offense (like he admitted he did) during that 6-game losing streak. The other source of their problems was the poor play of Francis and Mike James, who no one could expect. But that was a reality, and Adelman took too long to adjust, like by keeping Brooks on the bench for so long when they really needed someone like him, and who had proven he has what it takes (in college, in the D-League). He kind of had that JVG mentality that rookies can’t be trusted, and they have to earn their stripes by riding the bench for a year or two. That’s too old school, and thankfully Brooks is showing him that he’d be crazy to hold him out of the line-up. WOW!!! THIS IS WHAT I AM TALKING ABOUT!!! IT SEEMS COACH ADELMAN IS FINALLY LISTENING BY PLAYING AARON BROOKS MORE!!! AND NOW…LIKE I SAID YESTERDAY, IN ORDER FOR THE ROCKETS TO WIN BETWEEN 50 AND 55 GAMES THIS SEASON…THEY NEED TO INSERT LUIS SCOLA IN THE STARTING LINE UP INSTEAD OF HAYES WITH OR WITHOUT TMAC PLAYING!!! YAO + SCOLA + AB= ROCKETS NBA CHAMPIONS!!! (DUNCAN + GINOBILLI + PARKER= SPURS). (GARNETT + PIERCE + R. ALLEN= CELTICS). (JORDAN + PIPPEN + RODMAN=BULLS). (SHAQ + KOBE + PHIL JACKSON= LAKERS). (SHAQ + WADE + PAT RILEY= HEAT). I want to see whether Aaron Iverson Brooks will be sent to the D-League again. Hey John, another great report of the game. You are right, this Rockets team is starting to Gel. Let me add why I love this game too. I love this game because it’s so great to see a struggling team put in hard work and finally find an identity and become a team in its real true sense. Now I want to be cautious and not get too carried away, because these victories has come through teams struggling as of late. Also I can’t really get on Adelman too much, this dude knows what he is doing as far as respect goes. If you want to be a successful coach in this league or any other league, it’s not just about x’s and o’s and making the right substitutions. It’s also about giving respect to players such as Yao, Mcgrady, Hayes, Alston. Players who has been there before him. Now imagine if he scews Hayes and Alston for Scola and AB and it ends up not working, you can’t just expect him to go back to Hayes and Alston and expect them to honor their coach anymore. Respect goes a looong way. I am pretty sure he will slowly work Scola and AB in just as he has been, but I am sure it won’t be to the point where they will overtake Hayes and Skips minutes. This might change next season though, but slowly but surely it will eventually happen. Just imagine yourself at work overtaken by a rookie. Give Adelman props. Lastly, I know ppl have been on McGrady all year, calling him soft, no heart etc. He needs to stop settling for jump shots, well err untimely jumpshots at least, and he needs to show his true emotions more like Yao is doing now. Other then that the guy is still a special talent. More importantly the dude is not a bad guy. Check out this article I found. Tmac’s three-week absence is a blessing in disguise. No disrespect to Tmac, but it was difficult for other role players to get into the flow of the game in this new system when he dominated the ball so much. Now that Brooks and Scola got a chance to play more mins(and they blossom), the team is playing with more confidence and more intensity. They look more like a team as a cohesive unit as opposed to a one-man show. When Tmac returns, I hope he will learn to fit in and not continue his old way of playing. His talents can help the team in so many ways because he is a good passer and a capable defender. I would like to see him defend better, pass more and shoot less. No one wants to see him hoisting up 25 jumpers a game. There’s a lot of continuity, ball movement when TMac is not around. He could take more rests if he wants. Trade T-Mac for a future first round draft pick! The Rockets seem to be playing better without him anyways. We have enough talent in the guard positions on this team. McGrady’s shooting and field goal % is terrible in the last 2 seasons. Inject Scola in the line-up as well. He’s a good offensive rebounder …. reminds me of Boozer. With Yao, Scola, Battier, and Brooks in the starting line-up, the Rockets should be able to match up against any team in the league. I finally saw the highlights of the Knicks game on Youtube. With 6:10 left in the 1st quarter, Yao made a spin move to his left and somehow got the ball to go in the basket even after getting a hard foul from Zach. I don’t ever recall Yao making a spin move to his left and driving to the basket, it’s always been to his right. Am I right about this? If so, this must be a new move for Yao. According to Chris McCosky of The Detroit News: “The topic of Tracy McGrady came up in the Pistons’ locker room before a game last week. McGrady is now injured and unhappy in Houston. Reports there say he has told friends he wants to be traded — again. One player, who shall remain nameless, joked that McGrady was becoming more and more like his cousin, Vince Carter. “They should call Tracy, ‘half-man, half a season,'” the player cracked. It does not pay to tease T-Mac. He does not deserve that. No matter what, he is the best of the Rockets and the Rockets have to rely on him. Remember this is a team sport. He cannot win every game by himself alone or even by him and Yao. The other guys have to perform also. But when the opposing teams well know that the other 3 starters, namely, Alston, Hayes and Battier, can only score at an extremely low rate, it is not difficult to contain T-Mac and Yao with 5 guys. It is up to Rick Disaster Idleman to give minutes to Bonzi, Scola, James, Brooks and Novak who can score at a much better rate than the said THREE great starters. T-Mac or Yao is not responsible for the final decisions for the team. The responsible man is Rick Disaster Idleman. We must be fair and logical. Yo, BOBBYNYC, I def agree with what you said. Adleman is just trying to give his vets a chance to prove themselves before he switches to the rooks. I’m kind of sad that Tmac is unhappy in Houston. Hes a great player and we need him to step up to lift the rockets to a championship.